Barriers between hitting areas protect golfers but are not required by law. 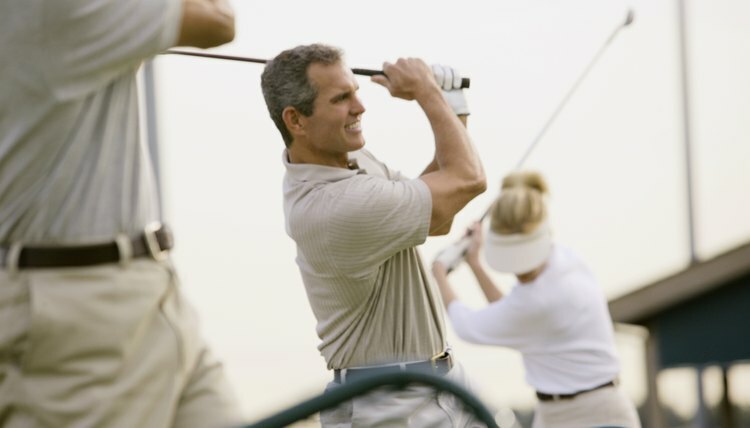 Some driving ranges, or practice areas, are attached to golf courses -- both public and private -- while others are stand-alone practice facilities. There is no federal law specifically dealing with the design and construction of the actual driving ranges, but they must provide access for people with physical disabilities and comply with various zoning restrictions. Additional local ordinances typically will come into play. Driving ranges must conform with the Americans with Disabilities Act Accessibility Guidelines, as issued by the U.S. Access Board, an independent federal agency. For example, the facility must have handicap-accessible parking, plus an accessible route between those parking spaces and a handicap-accessible tee area. The guidelines require that the path be at least 60 inches wide if it contains handrails, or 48 inches wide if it doesn’t. Five percent of the tees -- or at least one tee area, if the range has fewer than 20 tee boxes -- must be handicap-accessible. Accessible tee areas must “provide space for a golf car to enter and exit,” according to the ADAAG. Each individual driving range developer must negotiate the appropriate bureaucratic landscape, possibly including local, state and federal building codes, zoning laws or environmental regulations. For example, a Chicago-area developer who built a golf course and driving range on top of a construction landfill was required by the state to cover the area with 1 foot of clay plus some additional topsoil before proceeding, according to an article on Golf Range Times.com. The same website reports that New York developers who wished to build a range and entertainment center at an abandoned pier in the 1990s required local, state and federal approvals due to overlapping jurisdictions. It took two years and 25 permits before construction could begin. David Oatis, director of the Northeast Region of the USGA Green Section, says a typical private driving range requires a minimum of 1 acre of space, but urges designers to use at least 2 acres. He also recommends making the tee areas “as large as humanly possible,” which allows for an easier maintenance schedule. He advises against using multi-level tees, saying they often waste 20 percent to 35 percent of available space. An all-purpose practice area should include room for short game shots as well, says golf course designer Kevin Norby. In addition to a driving area that’s about 330 yards long, Norby advises designers to include a putting area of approximately 10,000 to 15,000 square feet, plus another green to which players may hit practice bunker and chip shots from as far away as 60 feet. He also reminds designers not to place the range near high-traffic areas, especially if they’re to the right of the tee area, because of the amount of slicing that’s likely to occur. Michigan State University Turfgrass Information Center: Building a New Driving Range Tee? Super Size It!